While at the library I was thumbing through the documentaries and came across one on Ralph Nader. I knew a little bit about the man, but not too much. Considering my interests are more financial and less political these days, I didn’t have high expectations. I was wrong. 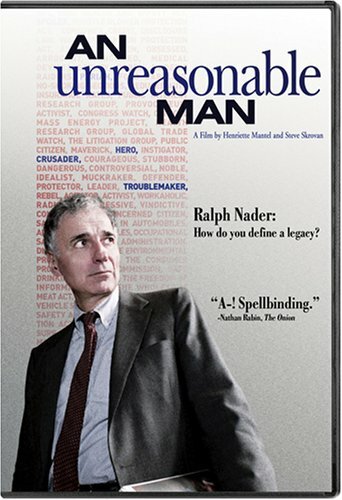 An Unreasonable Man was an outstanding biography of a man who has dedicated his life to improving the lives of others. I’m not saying I’m a Nader fan, but I am a fan of his drive and passion for pursuing his causes. The documentary wasn’t completely balanced, so don’t expect to walk away informed. You learn more about the man than the policies. The DVD comes with a bonus disc which was equally as good. There is an especially good section on how voting third party historically is a better catalyst for change than voting for the lesser of two evils. Too bad he gave the election to W in 2000 though. That one decision did far more damage than all the other good he has done in his life (which is admittedly substantial). With Diebold and the Supreme Court in his back pocket, W might have won anyway though. Maybe. Actually now that I think about it Diebold probably didn’t influence the 2000 election (though I think they delivered Ohio to W in 2004 based on statistical studies). Also, in Nader’s defense I guess there was no way to know what an unmitigated disaster W was going to turn out to be.